Editor’s Note: Lore DeAstra is our resident FHA expert and author of the FHA Inspection Checklist, Checklist Instructions and eManual. 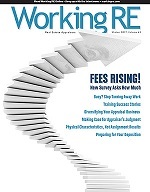 The eManual is recently updated with 23 new pages of material, visit http://www.workingre.com/fha-checklist-ebook/. Note: FHA suggests verbiage in every report stating something like: “The appraiser assumes the building improvements were completed in workmanlike manner and that the property conforms to all requirements within the local jurisdiction.” FHA does not have this statement in their materials. However, they have seen many similar statements in appraisal reports throughout the country. DeAstra: The key to appraising FHA (or HUD) properties is safety, security, and sale ability. Make sure the property adheres in terms of: basic needs, health and the safety of the property’s occupants. Before completing the FHA Appraiser Inspection Checklist, I spoke with several HUD employees and inspectors who directed me to information on their website. Handrails are required above 30 inches due to safety, since there would be more than four steps. DeAstra: You do not have to complete a “certification” to complete an FHA appraisal. In other words, completing a class on FHA appraising does not give you a certification like other appraisal courses. However, you do have to be on the FHA roster and must be a Licensed Certified Real Estate Appraiser (either Residential or General) in the state in which you practice. Q: Could I train someone else to do FHA appraisal and me sign off on them once I am Certified? DeAstra: No. Trainees are not allowed because FHA does not accept appraisals performed by trainees. In other words, they must be performed and completed by a Certified real estate appraiser. Since trainees are not Certified, FHA will not accept. DeAstra: We were advised by the FHA Homeownership Center to note the distances in our file. Many underwriters want an appraiser to include the sewer/water well sketch from the Health Department where the property is located. The FHA Checklist shows the following: INDIVIDUAL WATER SUPPLY AND SEWAGE SYSTEMS (L), which means to check local codes. Some of these guidelines refer to new construction but please keep in mind that FHA’s Supplemental requirements are in play (pg. 51 of the eManual) to make sure property adheres in terms of: 1. Basic needs; 2. Health; 3. Safety of the property’s occupants. For instance, if the water and sewer lines are too close together, there might be contamination of the water supply. Further, many counties suggest homeowners test their water sources regularly. Q: According to their representative, photos of the crawlspace have never been a requirement of FHA. What about this? DeAstra: I could not find any references to photographs of the crawlspace on any of the FHA materials. FHA does state to: “Provide photographs of deficiencies to support recommended action (pg. 41 of eManual). I personally take a photograph of the crawlspace for our file to prove that I looked and to make sure there is nothing that might interfere with: 1. Basic needs; 2. Health; and 3. Safety of the property’s occupants. For instance, you look in the crawl space and find old rags and other trash in pooling water. This trash may be flammable and the pooling water could cause the foundation to sag while insects are eating the wood. If you have a photograph in your file of the crawlspace and someone accuses you of negligence, you have covered your liability and made your E&O carrier very happy. Q: Does your checklist include other inspection items that are not required by FHA and for what purpose? DeAstra: We reviewed over +450 pages of materials and interviewed numerous FHA personnel to compile these materials. Over the past 18 months, thousands of these FHA materials have been sold with a 99 percent approval rating, with many appraisers checking the accuracy. As a result, we have made a few corrections over time for clarification or when the guidelines changed. The FHA materials are based on advice from FHA and our best judgment to diminish our liability, while completing an accurate appraisal. The FHA materials have been updated regularly since October 2009 and as recently as this summer when necessary. If you have not done so already, invite one of your local FHA inspectors out to lunch and you will learn more than you ever wanted to know about their job and how it might affect yours! When researching to compile the materials, we receive different advice at times, so the materials are based on the FHA mortgage letters, retractions, and advice from FHA personnel based on their three guidelines that are ALWAYS in place: 1. Basic needs; 2. Health; and 3. Safety of the property’s occupants. However, the FHA inspectors have guidelines that they follow, which are also followed by mortgage companies and the underwriters. It can get very complicated. $49 – Click here to purchase by check or fax/email. Or click the button below to purchase using a credit card on our secure server. FHA Inspection Checklist, Checklist Instructions and eBook will arrive within one business day via e-mail in PDF format. Click here to read a full review of the FHA material by Bill Cobb, appraiser and social media expert.